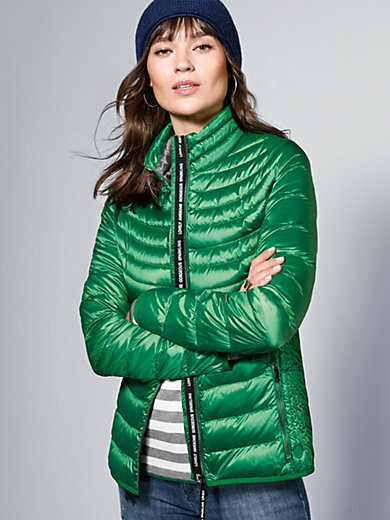 Quilted jacket by BRAX FEEL GOOD lightweight down jacket with a filling of 90% down, 10% feathers. The ultimate must-have for up-to-date casual outfits. This soft microfibre piece with beautiful stitching at the front and back, as well as lengthwise stitching on the sides, is a real figure flatterer. Wonderfully light, comfortably warm and easy to carry in the included bag. With stand-up collar, 2-way zip fastener, 2 zipped pockets and 2 inside pockets. In 60% polyester, 40% nylon. With contrasting lining made of 100% polyester. Length approx. 27ins. The quilted jacket is machine washable.